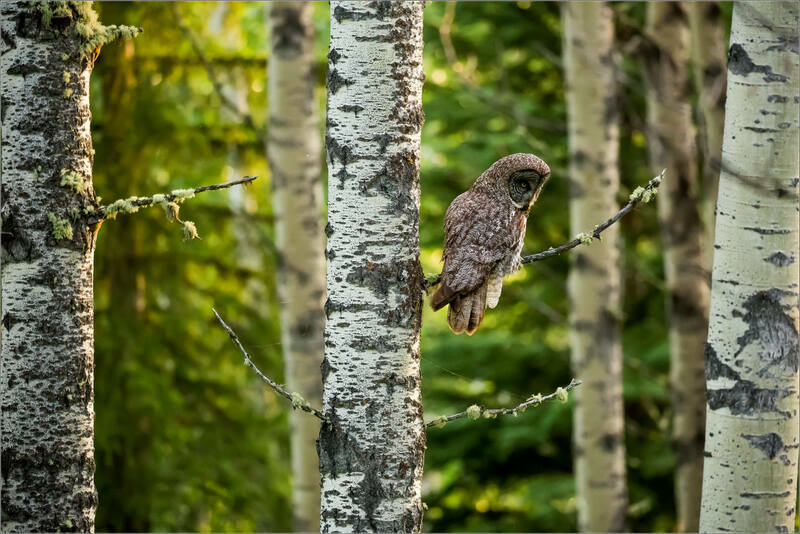 On a warm summer evening, down a country road leading nowhere, I found a pair of Great gray owls. One was hunting actively near where I set up while the other was perched deeper in the forest. The shadows lengthened and I hoped for a special moment before the sun slipped below the ridge to the west. 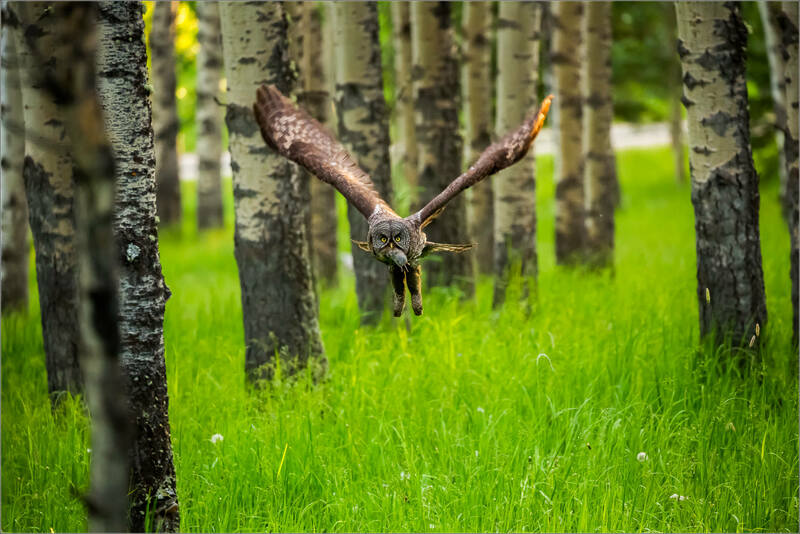 She flew over me and I thought that would be the end of the encounter as she flew into the trees. Instead, she alighted on this small branch and stared intently at a couple of spots in the grass. Shortly after she dove headlong into one of those spots and disappeared. 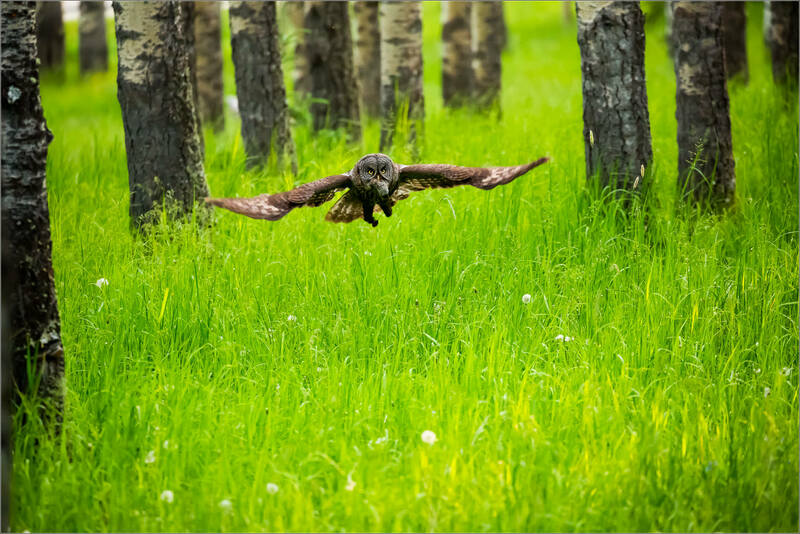 Several seconds ticked by and then she leaped into the air – with a field mouse secured in her beak. It was my good fortune that she flew directly towards me as she gained altitude before banking to her left and heading further uphill towards her nest. The first image and the ones directly below are the series as she flew through the trees towards me. These were a series of moments well beyond what I was even hoping for. This entry was posted on June 11, 2016 by Christopher Martin. 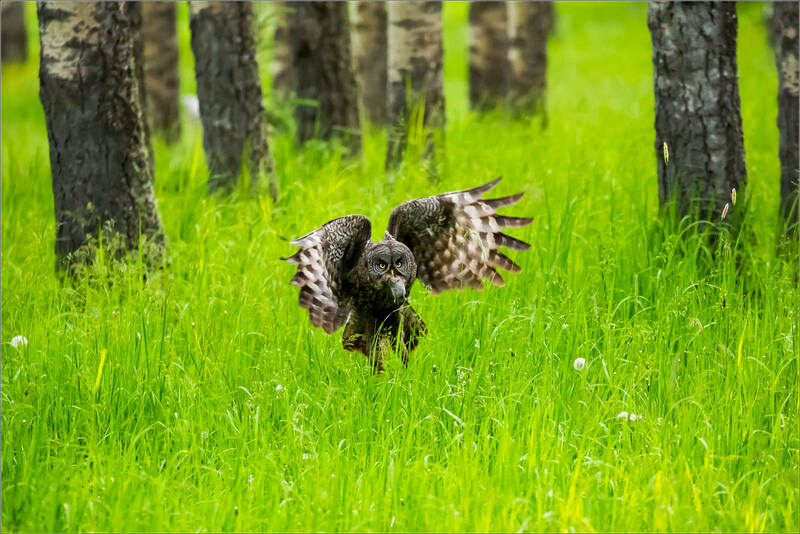 It was filed under Bragg Creek, Nature, Owls, Wildlife and was tagged with alberta, animals, birds, bragg creek, Canada, flying, Great Gray Owl, owls, strix nebulosa, wildlife. I know that the owl, and the owl with its trapped prey, is a fantastic shot… really, it is… but for me, the vivid lime green in this photo series is spectacular! That green steals the show! And what a show it is. Thank you for the beautiful photos. I like owls. You are very welcome. Me too!!! Not sure if you remember me – this is Charlene – I had been writing to you originally because I thought you were the photog going out with Dan into the Khutzeymateen and we kept in touch trying to get together near Calgary when all failed because of a huge nasty storm. 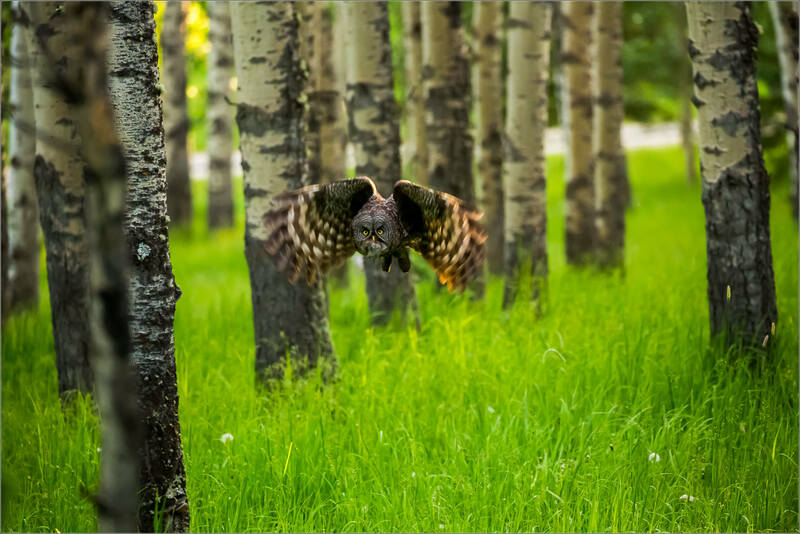 Just wanted you to know that I have still been following you and your work and am so excited for these excellent owl photos – and of course, so jealous! Hello Charlene! Very nice to hear from you. Thank you for your kind words. The time in the field continues to keep a big smile on my face and, when in the midst of an encounter, my pulse racing. I hope your photography adventures continue? Are you still looking at going to Myanmar for your birthday milestone? All the best to you and your husband! 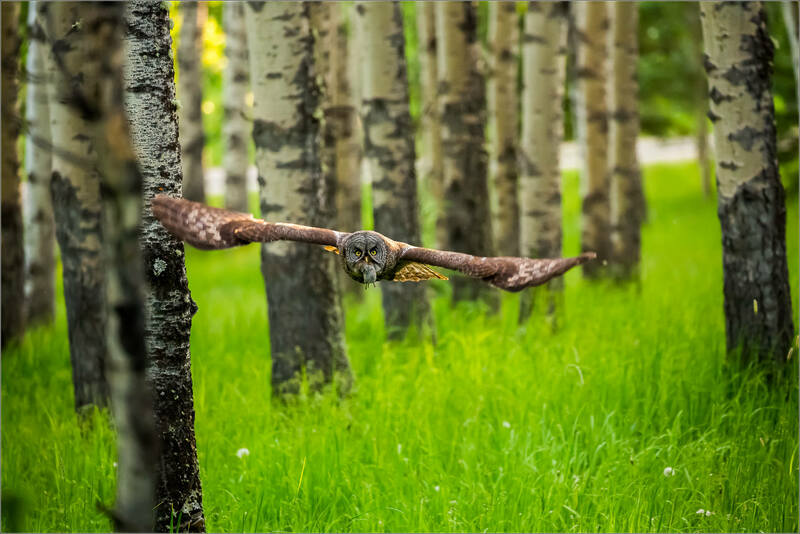 amazing photograph great timing to take this shot .congrats with a beauty-full image . Wonderful captures! The green background is just perfect for these owls. Christopher, you are simply amazing! Of course your pictures here are wonderful, but you set up and got the shots! Bravo!!! 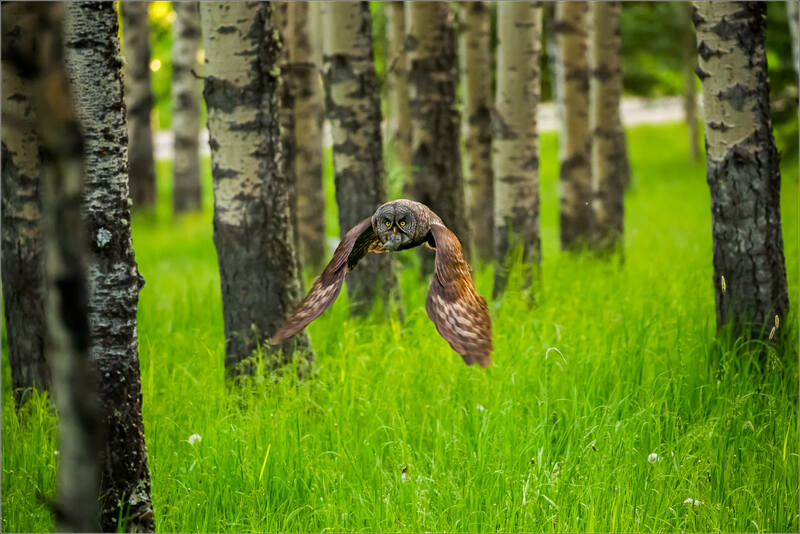 You have a gift for owls-lovely shots, Chris. Stunning and amazing shots. These are first class. Thank you Victor. Very kind words that I truly appreciate you sharing. Beautiful set of pictures! 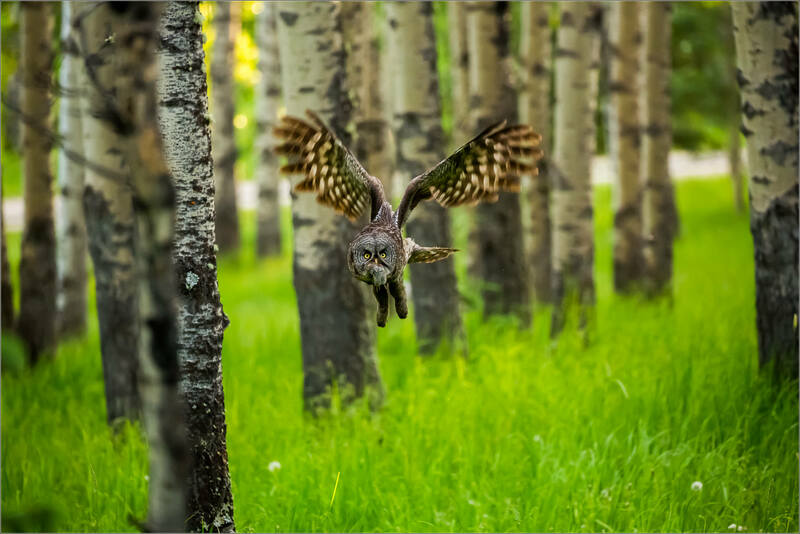 You always seem so sure of the gender of the owls you photograph. How do you do that? I thought that the only difference between male and female was size (female larger), but you would probably have to see the pair together to make that determination. Thank you for the comment and the query! With the owl in this story, I was able to compare the size of the two and this was the larger one so I believed this to be the female. In other photos, it is often based on what I feel from spending time with them – I often find myself thinking of a bird as a he or a she. That may well be a flight of my own fancy so please don’t take it as a fact in any way. I feel referring to an animal as “it” is too cold and misrepresents the connection that I often feel with those that I encounter. With some wildlife, it is obvious what their gender is. With others, I prefer to make a guess (educated or otherwise) and try to share some of what I feel in those moments when I am with an animal who displays their personality, shows their intelligence and communicates on a soulful level. Calling that creature an it never sits well with me. What a terrific series of photographs! Magnificent encounter and photos! Thank You for sharing! Ah so grand! I love how he stares straight into camera as he swoops!